In an easy, clickable format, the differentiator allows you to create different tasks, by changing theÂ Bloomâ€™s TaxonomyÂ level, the content students study, the resources they use, the products they will create, and the grouping patterns (including individual work). One caution: remember to think about the learning objectives. If the goal is for students to be able to analyze primary sources, we cannot then create a task that asks students to merely define terms. They wonâ€™t be able to successfully analyze sources after that learning activity. However, we could ask some students to create an infographic (free resourcesÂ hereÂ andÂ here), some to create anÂ interactive portfolio, and others to develop aÂ podcast commentaryÂ on the sources, all analyzing and synthesizing information. Different tasks, one objective. 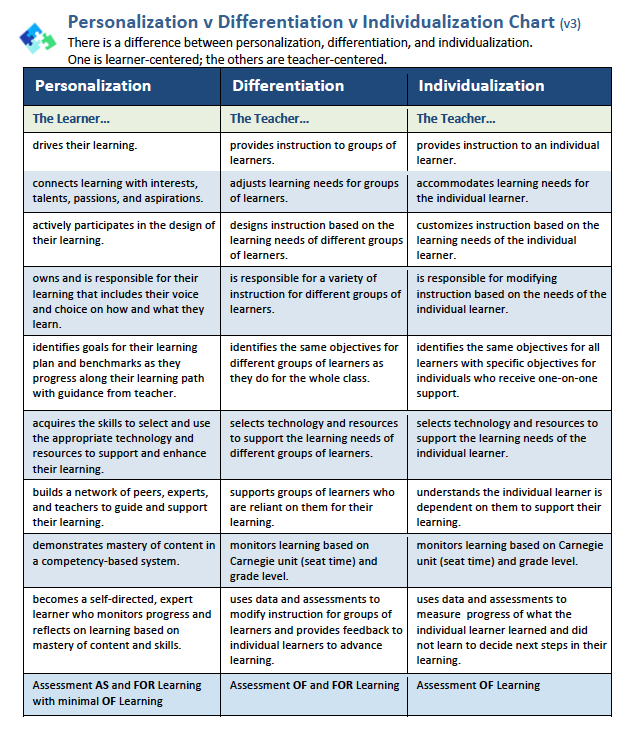 It’s also important to distinguish between personalized learningÂ and individualized instruction, which are often confused with differentiation.Â This chart, from Personalize LearningÂ (@plearnchat) is a helpful way to distinguish between these three ways to help students learn more effectively. What resources do you use to think about differentiation, personalization or individualized instruction?